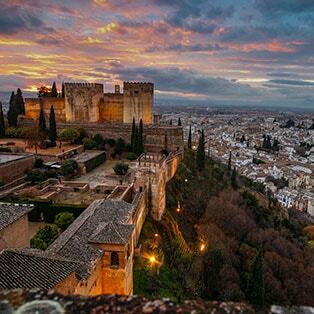 The Nasrid Alhambra was a courtly city, conceived and built to serve the royal court. The urban layout was clearly organized during the two and a half centuries of its development, with the logical transformations brought about by the successive architectural styles. 01 – Promenade of the Cypress Trees, Secano (“Dryland”), Gardens of the Monastery of San Francisco. 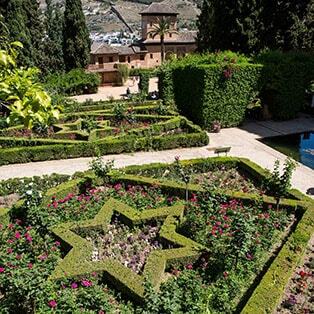 After walking up a narrow landscaped path with a view of Sacromonte, on our left appear the north wall of the Alhambra and the remains of walls and some pavement that mark the location of what is currently called the Court of the Fig Tree. A small pergola leads to a wide esplanade corresponding to the lower terrace of the Partal. To the left is the architectural structure for which the location is named: the Partal Palace portico.As is customary in these buildings, it is situated, like the Palace of Comares, on the premises wall. The portico, with its five arches, overlooks a large pool in the centre of the garden. Behind the portico is the main room, located inside the tower known as Las Damas. 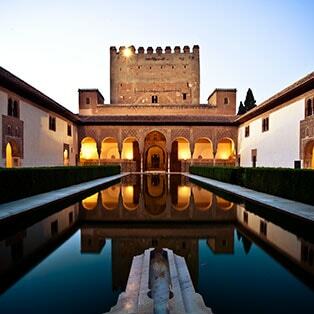 One of the reasons why the Palace of the Partal stands out from its neighbouring Comares and the Lions, which have maintained their overall structure since the days of the Nasrid, is that the Partal was only included in the Alhambra a little more than a century ago. Coming away from the lovely intricacy of the Partal Gardens, the narrow way that connects the two palaces of the Alhambra leads to a snug platform with a handrail extending along the foot of the wall that encloses the Palace of Yusuf III (1408-1417). Outstanding is the long pool in the central courtyard with a lush garden, on the sides of which are the ruins of some rooms marking the site of a large building, structurally resembling the Palace of Comares . All visitors must carry their ticket, printed on A4 paper, obverse and reverse and keep it until the end of the visit. In addition it will be possible to visit, the place that has been designated “space of the month”, only if it is placed in the itinerary of this type of ticket.